MSN Local Edition is the newspaper for the online generation. It lets the visitors see local weather, traffic, news stories, and restaurant reviews in one place. 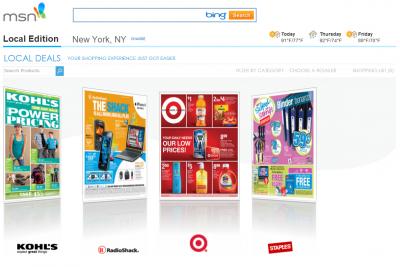 The new offering simulates the experience of flipping through Sunday circular ads online with a intuite online experience (Notice the Silverlight and DeepZoom goodness). The back-end data for the circulars comes from ShopLocal. The online circulars feature deals at local branches of major chains, and the site is geo-targeted (US Only – Bummer!). You can also search for products across circulars, add items to a shopping list, find retailer locations with Bing Maps, and share offers with friends through Facebook, Twitter, and Windows Live. Thanks to Kim Lowe at @MSNLocalEdition for the tip via email!